Use the code PC-GAMER20 to get 20% off advance tickets. 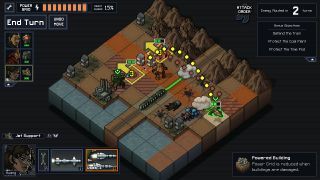 It’ll be done when it’s done, but that doesn’t stop you from being able to hear all about Subset Games’ upcoming Into the Breach at the PC Gamer Weekender. The folks behind instant classic FTL Faster Than Light will be on hand Saturday, February 17, to give a talk on the PC Gamer Stage about how they’re going about making another strategic great. We love what we've played so far: check out the preview here. A mini-strategy title with surprising depth, Into the Breach tasks players with fighting off an insectoid invasion using humanity’s last few giant stompy mechs. If you fail—which you will, a lot—the last of your mech pilots is sent through a wormhole to an alternate timeline in order to start anew and try, once again, to fend off the invasion. It is, put simply, a brilliant idea. Find out more about Into the Breach on the game’s official site and keep up to date with minute-to-minute changes by keeping an eye on Subset’s Twitter. Joining Subset’s Into the Breach stage presentation, you’ll be able to see many more speakers, games and booths all at the PC Gamer Weekender, which is being held February 17-18 at the Olympia, London, in the UK. For more details see the site, and follow us on Twitter for up-to-the-minute news. Tickets are available now from £12.99, but don't forget to use the code PC-GAMER20 at checkout to get 20% off advance tickets.